Sharing another winning recipe from Chef Linda of Esther’s Kitchen! Place a small mixing bowl on the top of the oven. 1. Place the Earth Balance and 1/2 cup almond milk in a microwaveable bowl. Microwave on 30 second increments until the buttery spread is melted. 2. Pour the heated almond milk and buttery spread in a food processor or electric stand mixer with dough attachment hook. Add the remaining dough ingredients. If using a food processor, turn it on and use the dough button. Process the dough for about 3 minutes or until a dough ball forms and spins around. Turn the food processor off. If using an electric stand mixer, turn the mixer on medium and mix until a dough ball forms. Turn off the mixer. 3. Place the dough ball into the warm mixing bowl. Wet a paper towel or cloth towel with hot water. Wring out the water and place the towel over the dough. Let the dough rise slightly while you make the filling. 1. Combine the filling ingredients in a small mixing bowl and stir until combined. 1. Spread the 1 Tablespoon of flour on your work surface. 2. Roll out the dough into a rectangle that measures 9″ x 12″. Use a ruler for accurate measuring. 3. Sprinkle the filling evenly into the dough rectangle. Press the filling lightly into the dough. 4. Starting from the 12″ length, tightly roll the dough into a log with the seam side down. Using a sharp knife, cut the log into 1″ pieces. Use a ruler for accurate measuring. 5. Spray a 9″ round baking dish. Place the buns in the baking dish on top of the stove. Cover the buns with a warm towel while you make the Sticky Topping. 1. Add all ingredients in a small saucepan. Heat the ingredients on low heat until the sugar and coconut oil melts. Stir constantly with a metal spoon to prevent scorching. Turn off the heat and pour this sticky sauce over the buns. Bake the sticky buns for 15 minutes at 350F. Remove the buns from the oven. Grab 2 plates. Place one plate over the buns. Invert the buns onto the plate. Remove the baking dish. Place the second plate over the buns. Invert the plates so the sticky pecans are on top. This method prevents the sticky buns getting stuck to the bottom of the pan. The traditional method for making sticky buns is placing the sticky mixture on the bottom of the pan then the buns are placed over that mixture. Note: If you want stickier buns, double the Sticky Topping Ingredients but only use 1 cup pecan halves. Walnuts will also work for this recipe. For more information on Esther, visit www.estherthewonderpig.com, or like her page on Facebook. Also, be sure to follow Esther’s Kitchen on Facebook for more wonderful recipes like this!! 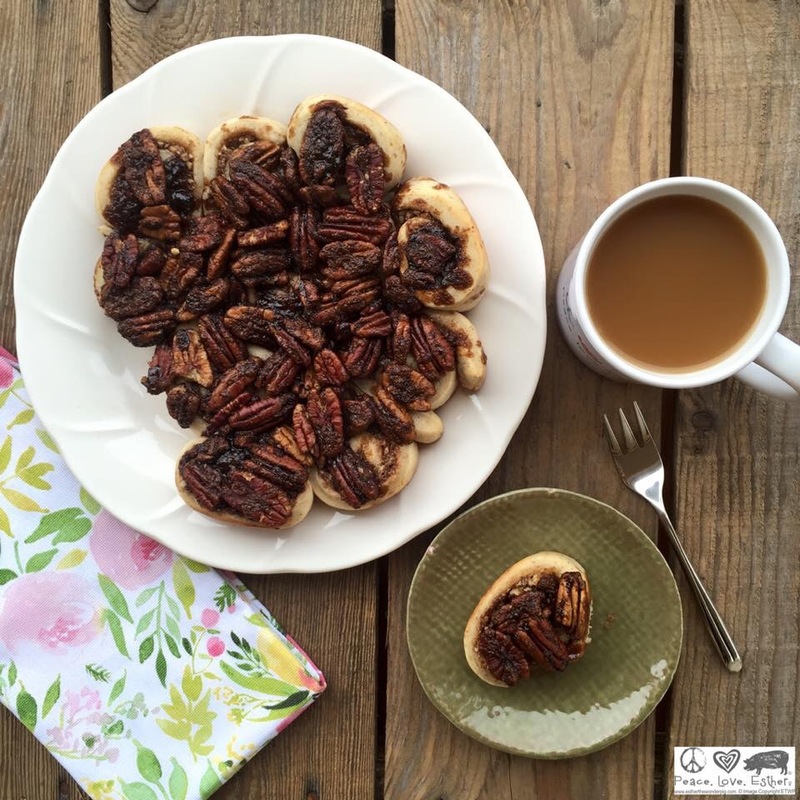 This entry was posted in Cooking/Food and tagged esther the wonder pig, national sticky bun day, sticky buns, vegan by houseof9lives. Bookmark the permalink.